Where has the time gone? Your babies are growing into teenagers, and you just can't believe it. You want to make sure your children are safe and happy all the time, but you also want to give them room to grow into well-adjusted adults. The following are a few tips to help you be a good parent without being overbearing. You've helped your children make all of their decisions, whether big or small, since the day they were born. As they grow into teenagers it can be difficult to give up some of that control over their lives. Instead of fighting for power, ease both your kids and yourself through this transitional phase into adulthood. Clinical psychologist Dan Griffin tells the Chicago Tribune that parents should start letting their kids make some of the decisions as early as eight or nine years old. Ask them where they want to go for dinner or what extracurricular activity they want to do after school. Griffin explains that if kids feel a sense of respect, they'll be more mature and engaged rather than resistant. Plus, the transition will help you get used to the idea of your kids growing up. As you let your teens make more of their own decisions, you also should encourage them to take on more responsibilities. 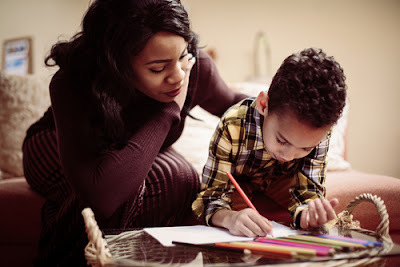 This can be part of the transitional phase so your kids don't get overwhelmed with adult responsibilities and you have enough time to teach them. For example, if they want to go to a movie with their friends, have them earn the money by doing chores around the house or getting a part-time job. Similarly, if they want to get into college, explain that it's up to them to earn good grades and fill out their applications on time. Let your teens know that you're always there to help them, but it is their responsibility to work for what they want to achieve in life. Your teens are dealing with a lot of changes in their lives, and that can be stressful. When they get home from school, give them some space to unwind and do what they want. Even if you have good intentions, asking questions the moment they walk in the door may feel like you're prying or don't trust them. Let your kids come to you to talk about their day or any problems they're having. You also should give your kids some alone time. Your teens are learning to be independent and don't want to rely on you for every little thing. Let them stay home by themselves, extend their curfew and let them go out with friends. If you're nervous about their safety, install a home security system. Both you and your kids will feel safe knowing that the perimeter of the house is secure thanks to motion-activated push notifications sent straight to the home screen of your smartphone. This allows you to quickly check and notify your child and potentially the police of any threats. And you can also check in on them remotely if you want to make sure they made it home from school or if someone's at the door. One of the best things you can do as the parent of teenagers is to listen. If your teenagers are complaining about a teacher, having a problem with a friend or feeling worried about college applications be there to listen. You don't need to solve all of their problems for them or tell them what to do. Sometimes they just need to vent their frustrations. Even if you have great advice, your teens may not want to hear it â€” and that's OK. Instead of telling them what you would do in their situation, ask them what's going on and really listen. If they ask for your help, then feel free to jump in. Just be respectful of their feelings and know that it's perfectly normal for them to start figuring things out on their own.